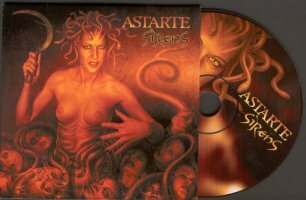 Astarte from Greece are a very interesting band. Most interesting of all is of course that it’s a women-only-band, something which is absolutely unusual in Metal, most of all in Black Metal. It’s clear that Astarte always got and get bad and stupid critics and a lot of vulgar statements from the male Metal-press, but I think this is very unnecessary, because Astarte are a good Melodic Black Metal-band, with a special touch of course. Their sound is most of the time epic, majestic, dark and also kind of opulent. I would say their biggest influences are old Dimmu Borgir, old Emperor, Primordial and sometimes, the keyboard-parts remind me a bit to old Mystic Circle, but perhaps somebody else sees that different. It’s positive that most of the time the guitars dominate the song, and they often also make the melody. In the label-info is something written about Black/ Death Metal, but I can’t find any elements of Death Metal in “Sirens”, except for some growl-vocals of Tristessa. I think Astarte used a drumcomputer on this album, because the drum-sound is very steril and not very lively, most of all the cymbals. The production is good, but that’s absolutely necessary if you play this kind of Black Metal. On “Sirens”, three guest vocalists appear. The most known is Shagarth from Dimmu Borgir I think, and his part in the “The Ring (Of Sorrow)”, which has the best keyboard-intro of the whole album by the way, is fantastic, his very characteristic, high and croaking voice fits perfect to this song, and he sings about half of the words in “The Ring (Of Sorrow)”, which is also my personal favorite on the album. Sakis’ (Rotting Christ) part in “Oceanus Precellanum (Liquid Tomb)” is very short and his voice is also very distorted, so I don’t know why he had to sing this part. And finally Nicolas SIC Maiis from the band Lloth (never heard of), who sings in “Bitterness Of Morality (MecomaN)”, I also like his part, he’s got an aggressive, pressed voice, and the change between his and Tristessas vocals also fits. (it’s funny, “Outbreak” sounds always like “Odin”, Tristessa has a great Greek accent), as I said before “The Ring (Of Sorrow)” and the very aggressive and hateful “Black Mighty Gods”. In conclusion I can ascertain that “Sirens” is a good Melodic Black Metal-album, with some shadows, but also a lot of highlights. But it’s for Melodic Black Metal-Fans only, nothing for True Blackies.